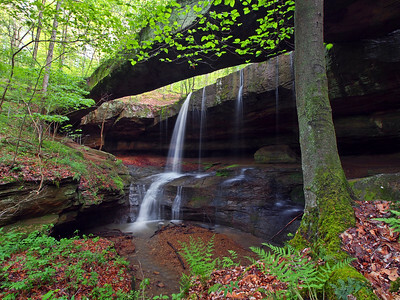 Located in central Ohio, Hocking Hills State Park is a concentration of parks with numerous beautiful waterfalls and cliff side vistas. 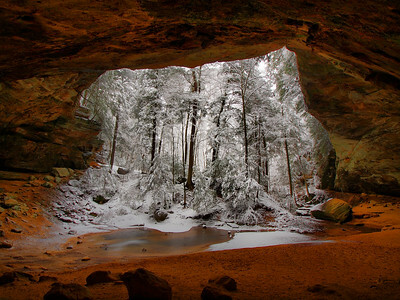 Ash Cave Hocking Hills State Park Hocking County Ohio This is one of my favorite photographs of Ash Cave in Hocking Hills State Park that I have ever taken. I was looking for a perspective I had never seen nor shot before and I think I found it. 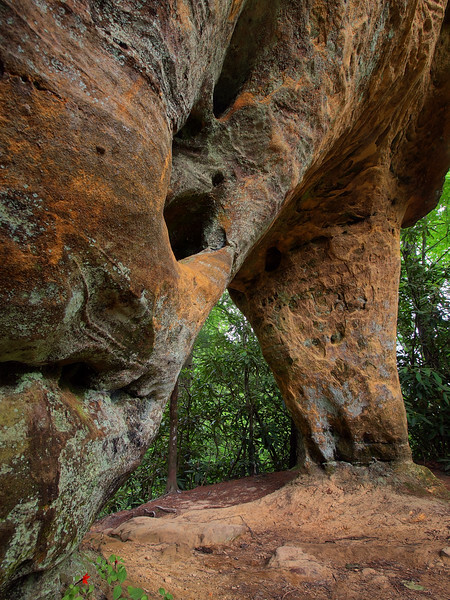 The "cave" is really a massive sandstone recess 100 ft. high and over 600 ft. across. Really cool without snow, but with, the cave is absolutely gorgeous. 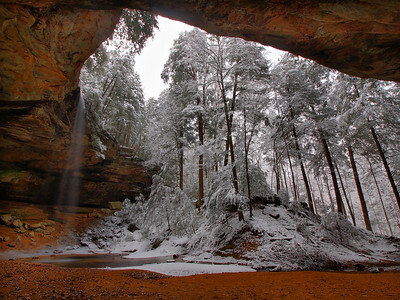 Ash Cave Hocking Hills State Park Hocking County Ohio I've been to several rock shelters in Kentucky, Tennessee and Ohio, but hands down my favorite is Ash Cave in Ohio's Hocking Hills State Park. I can't say it's the largest I've been to but I know it's close. This past December we traveled to this beautiful area in a Winter Storm Warning and it was beyond worth it as I haven't seen to many scenes as beautiful as the ones I did that day. 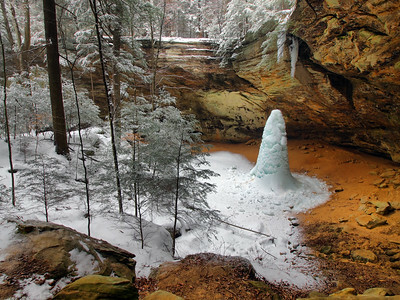 Ash Cave Hocking Hills State Park I just think the Ash Cave Ice Cone so flipping cool. In the past I've seen some ice cones but nothing like this. It's such an impressive formation standing there almost like it's a guardian of the splash pool. One of the things I wanted to do while here was to get some perspectives of the cave that I had never got before and a really was digging trying to find one from the frozen creekside. I've visited this place so many times and each time I was greeted with something different, sun, fog, rain, heavy waterflow, snow and now ice. I guess the only thing left for me to do is to visit in the Summer after a major rain event, after all, me shooting a waterfall in the Summer is a rare occurrence indeed. 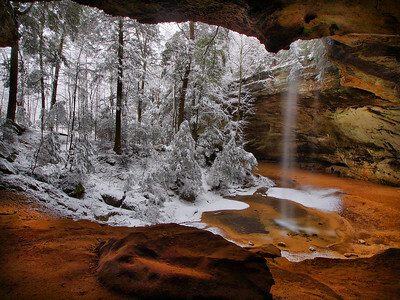 Ash Cave Hocking Hills State Park I couldn't take it any more. I had to get out and shoot this weekend. 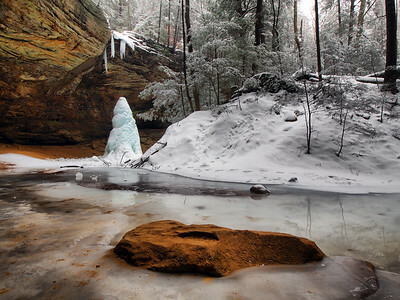 After seeing a recent post from a friend on Facebook I decided it was time to go make the trip to Hocking Hills to shoot the massive Ash Cave Ice Cone, and half the fun was getting there. Sunday morning it took us 3 1/2 hours to drive the 120 miles into Central, Ohio as there was a winter storm advisory throughout the state and the deeper we went into the state the worse conditions got. Chillicothe was a mess and I was concerned the road between there and Ash Cave was going to be a challenge. Well, it wasn't that bad, just a slow pace. But once we got onto the road about 4 miles from our destination it was quite clear that this was going to turn into a challenge as we were the first car to drive on a completely untreated road, undaunted we continued on. Before long we came to a steep hill and I attempted to ascend it to no avail, I was slipping about halfway up the hill. So I backed down. I would also like to say "thank you" to the fella who came down the hill and didn't bother to slow down or anything when I was slipping and sliding going backwards in my lane. So we went back to the corner gas station. Along the way we passed a plow, who wasn't plowing the main road but did turn off and begin plowing a side road. Lisa suggested we follow it, but I wasn't sure where it was going. After I confirmed the road would take us the back way to Ash Cave we shot up the back road slipping and sliding up the hill, grabbing just enough traction to make it to the top. We drove over the ridge and then easily descended to the Ash Cave parking lot. There's nothing I like better than being the only car in the lot. We walked back the short path and we couldn't believe our eyes, Ash Cave is impressive in it's own right, but put a 50 ft. tall blue pillar of ice in it and it's simply mind blowing! After spending and hour and 1/2 shooting it from all angles off we went, it had started to rain and we didn't feel like dealing with that so we headed home, bucket list item accomplished. I'll have a post or two more of this spectacular phenomenon over the next couple days. Big Spring Falls Hocking State Forest Ohio Joined by good friends Bryan Janosick and Jason Haley we met up with good friend and fellow Static Brother Karl Hassel for some running around Hocking Hills. Originally the plan was to visit the northern parks, including an old mill called Rock Mill, but when we passed near the mill heavy rain and thunderstorms were bearing down on us. So we all decided to head down to Ash Cave since it was the best place to stay out of the storms and still shoot. Eventually the storms stopped and were ran off by the hoards of people who arrived. Opting to head to Big Spring Hollow Falls in the nearby Hocking State Forest we made the quick jaunt to the parking lot. The last time I had visited Big Spring was several years ago in a winter storm warning, so I was pretty hyped up to see it in the conditions I had hoped, gushing! I was fully expecting an off trail hike but things have changed and now there's a easy trail to the falls through the hollow. At the mouth of the hollow you could hear it, and boy did it sound loud. Big Spring Falls is a towering monster in the right conditions. 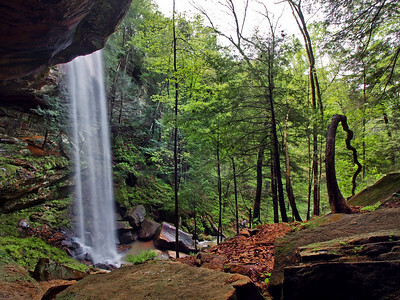 Taller than nearby Ash Cave by a few feet, a full drape of water was crashing down on the rocks below! After shooting from the base I decided to head up to the rock recess behind the falls and check out the view! Wow! What a scene as you look out over the creek from behind the falls! 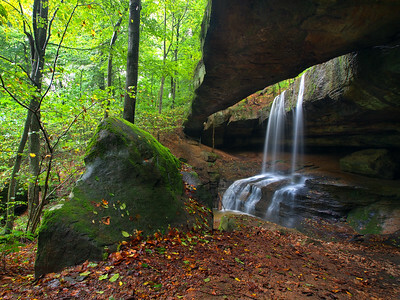 Hands down one of the coolest waterfalls in the state of Ohio! If you look far below in the creek you can see Karl and Jason, oh and I just loved that tree off to the right! 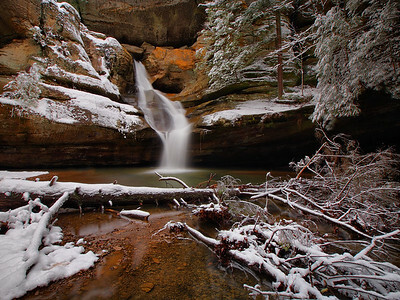 Hidden Falls Cedar Falls Area Hocking Hills State Park It was several trips to Cedar Falls before I discovered for myself this nearby beauty, the properly named Hidden Falls. Since that time I first shot it I have found this falls to be a difficult subject, but on this day it was the most beautiful I'd ever seen it. 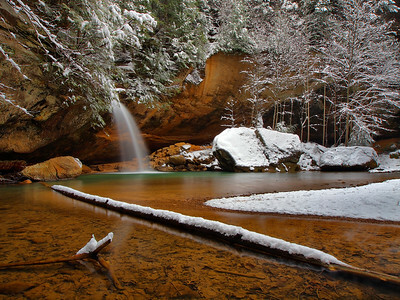 Cedar Falls Hocking Hills State Park Hocking County Ohio When I heard an old hemlock had fallen in the splash pool at Cedar Falls at Hocking Hills State Park I was a bit concerned that it would ruin the scene, but to my joy it had not. It was interesting how the tree had changed the demographic of the splash pool as sandstone has collected around the tree forcing the water to flow to the far right. 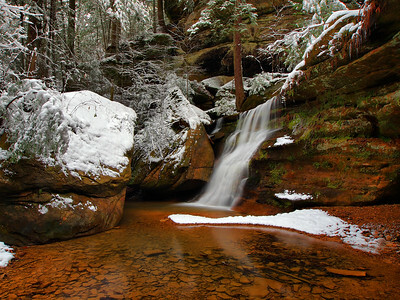 Lower Falls Old Man's Cave Hocking Hills State Park Hocking County Ohio The Lower Falls At Old Man's Cave at Hocking Hills State Park in Ohio has a lot of really cool perspectives and what's so cool about that is the falls can look very different depending on where you are standing. This is one of my favorite perspectives as you can see the entire falls in all it's glory. 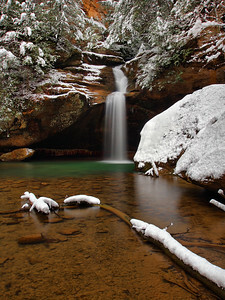 Lower Falls Old Man's Cave Hocking Hills State Park Hocking County Ohio I never imagined how beautiful the Hocking Hills area would be under a blanket of fresh snow. 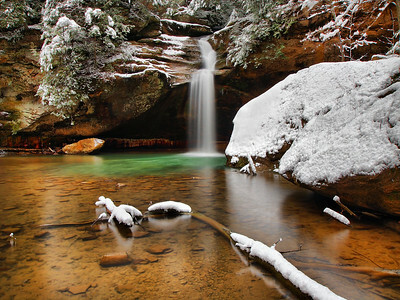 The contrast between the sandstone and the snow was just off the scale and the beauty of The Lower Falls At Old Man's Cave was a scene that you only see in a dream. Mother nature at her best. Rock Bridge Rock Bridge Falls Rock Bridge State Nature Preserve Hocking Hills Region Rock Bridge Ohio Almost 10 years ago in the fall of 2007 during a drought myself and good friend Jason Haley made our one and only visit to Rock Bridge in the northernmost section of the Hocking Hills region of Central Ohio. I remember I didn't care much for the hike but I really thought the bridge was pretty awesome. 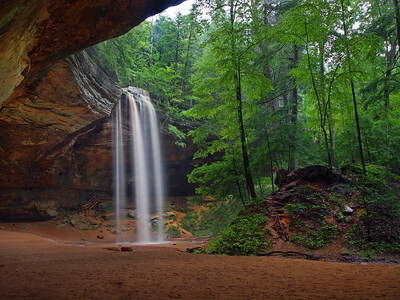 Although I've been to Hocking Hills many times since, it never did work out that I would return. Oddly, it wasn't until a few years ago that I found out there was a wet weather waterfall at the bridge which really upped my desire to revisit. Finally, this past weekend I got the chance to see this unique landform after a morning of heavy rains. Myself, along with good friends Jason Haley and Bryan Janosick arrived for a late day hike. Though moderate, I quickly remembered why I didn't care much for the hike; a somewhat boring fieldside hike (at least the first 1/2 mile with a lot of exposed roots) and this time it was pretty muddy too. Eventually we did drop into the woods and met up with a nice flowing stream. I told Jason and Bryan that if this was the waterway that falls at the bridge that this "was going to be awesome!" And sure enough it was! Wow, what a scene! As we walked up you could see the top natural bridge stretching out over a mini gorge as the water fell below from a cliff 10 ft away from the bridge! 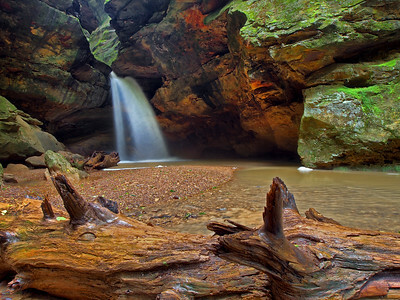 At 100 ft across Rock Bridge is considered the longest in the state and is complimented by a 40 ft tall waterfall. 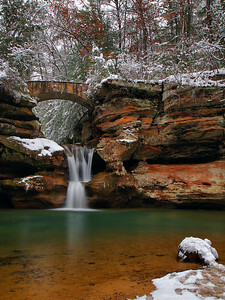 Folks, it just simply doesn't get much better than this when it comes to sandstone bridges and waterfalls, truly one of the the best in the east! 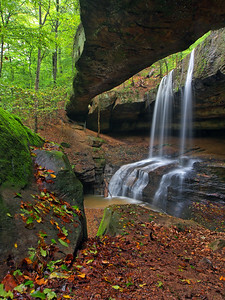 Upper Falls Old Man's Cave Hocking Hills State Park Hocking County Ohio In my opinion The Upper Falls At Old Man's Cave at Hocking Hills State Park in Ohio is the most difficult falls to shoot in the area and I've posted very few shots of it, but on this visit to the falls I think I got some unique images of it, here's my favorite. 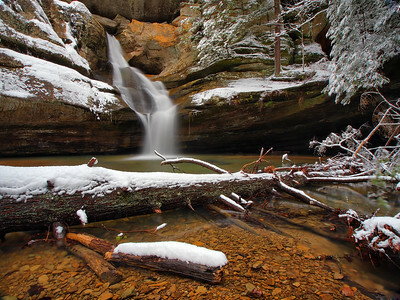 Concles Hollow - Main Falls Concles Hollow State Nature Preserve Hocking Hills Hocking County Ohio I've been to this falls many times over the years and have never seen it in conditions like a did here. Such a rare opportunity to see in raging as it is here! 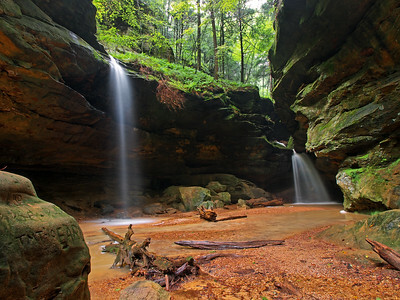 Concles Hollow - Double Falls Concles Hollow State Nature Preserve Hocking Hills Hocking County Ohio Myself and good friends Chris Morris and Adam Thompson headed to Hocking Hills during a massive rain event caused by the remnants of Tropical Storm Gordon. 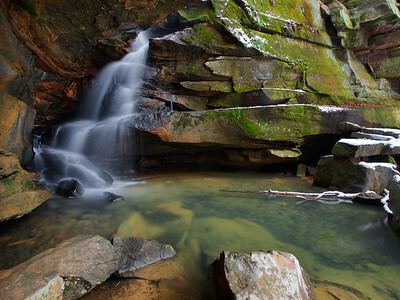 I've been to Concles Hollow Nature Preserve more times that I can count and I had only seen the left waterfall barely flowing on previous time. I really didn't expect much honestly, but as we made our way to the back of the mini slot canyon it was quite evident we were in for a treat! Both falls were gushing! I had never seen so much water here and the sound was awesome as it echoed on the canyon walls! A little side note, on our way in we noticed an arch along the canyon wall. Chris noticed it as you could see a side waterfall flowing across the rock behind it. It turns out it's the 100th arch I've visited. I was hoping for one a little more exciting but you can't always get what you want and it was cool anyway!